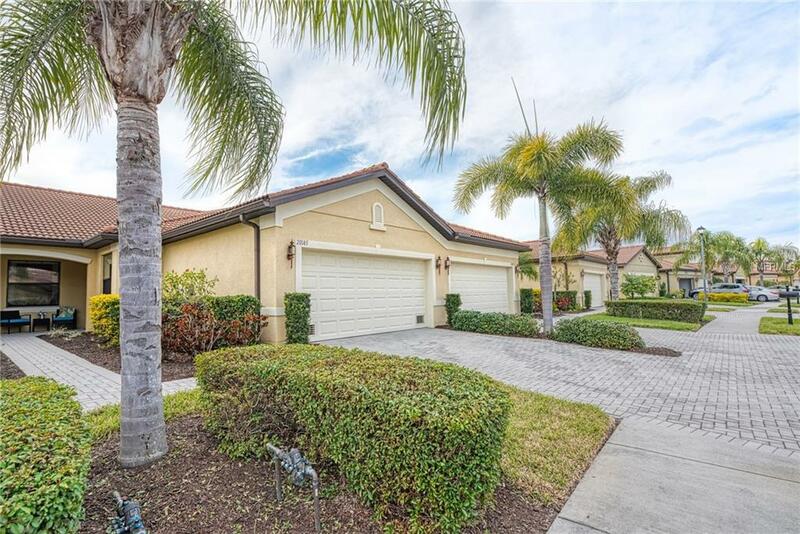 Appealing two bedroom, plus den, two bath, attached villa in desirable Venetian Falls. Your villa features tile floors in all main areas and carpeting in bedrooms and den. Very clean and well maintained by these original owners, you can move-in today! The kitchen features granite counter tops, stainless appliances, wood cabinets and a large closet pantry. You have a breakfast bar and there is eating space in the kitchen. The kitchen opens to your dining and living room area. Sliders from your living room to your brick paved lanai. Private wooded view from the lanai. The master bedroom has plenty of room and there is a large walk-in closet. Your den/office has views of the lake through the green space across the street. Refrigerator and microwave are less than a year old. Venetian Falls offers resort style amenities, beginning with its recently refurbished clubhouse, community center, billiards and card rooms. It also offers a heated community pool and resistance lap pool, fitness center, bocce courts and more. Come see this great buy and belong to this wonderful community!